Paul explains that we are saved by Grace not by works. He then warns us not to cast off the God’s grace and revert to a system of works after our salvation. For, just as we’re saved by grace we are also sustained by grace. Paul says we “began our life in Christ” by the grace of God and we should not “try to make it complete by your own power” (Galatians 3:3). The New Century version concludes their translation with the exclamation “that is foolish.” Most other translations put it as a question, “are you that foolish?” Perfectionists are not only foolish, they also make themselves miserable as well as everyone around them. Talking about extreme efforts of perfection, Solomon asks, “Why should you ruin yourself?” (Ecclesiastes 7:16). Trying to achieve an unattainable goal, and holding others to an unattainable goal is a very destructive way to live. One thing that it can destroy is my initiative. When we read the Old Testament it’s sometimes difficult to get a clear understanding because we live in a different culture. Literal translations of the Bible focus on each word. Dynamic equivalent translations focus on an entire thought. For example for Ecclesiastes 11:4, most of the literal translations read, “One who watches the wind will not sow, and the one who looks at the clouds will not reap.” But the Living Bible says, “if you wait for perfect conditions, you’ll never get anything done.” I can remember a report of a mountain lion wandering the hills around Neihardt park several years ago. I have a friend who even has a picture of a large cat-like animal running across a field near the park. Kathy woke me up at 5:30 one morning and said “come on get dressed, we’re going for a walk around Neihardt Park.” I yawned and said, “don’t be silly, there’s a lion in the park!” Twice in the book of proverbs Solomon tells us that the lazy man says he can’t go to work because there’s a lion in the street (Proverbs 22:13, 26:13). A sluggard uses any excuse not to do what he should. 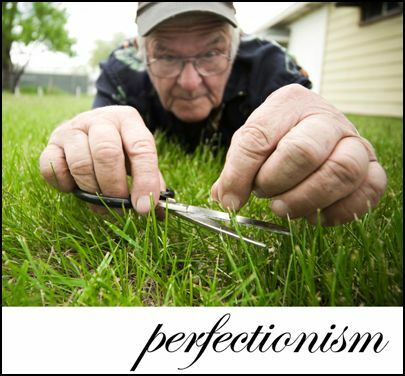 I’ve known believers who won’t serve in the church because they don’t feel “good enough.” You see, perfectionism can destroy my initiative.